Cheshire based interior design practice Elite Design Studio was established by Gemma Merrick and Cassie Heathcock in 2016, two entrepreneurial business women and designers with over fifteen years of combined experience within the industry. Having built a successful partnership working together for six years at a previous design practice, Gemma and Cassie felt it was the perfect time to combine their shared passion and experience, and launch their own successful interior design company. Both Gemma and Cassie pride themselves on overseeing each and every client project personally, from the initial design concept right through to the final installation day on site. They are involved in the entire design process, both working extensively on each and every detail and utilising their skillset at every stage. This attention to detail has earned them a reputable stature within the interior design industry, and they boast an impressive portfolio of client projects ranging in scope and style both nationally and internationally. Their personal approach allows them to build close relationships with their clients, understanding how they live on a day to day basis which is such a vital component for shaping how they design each project. Gemma and Cassie were appointed to work on this Cheshire based family home, when their clients felt they needed help to refurbish a tired and outdated interior and wanted a fresh injection of style and luxury. The extensive 8000 sq ft project was commissioned by a young couple with two children, who had been living in the house for the last 10 years, and were looking to create a more on-trend and contemporary family home. Elite Design Studio were given a brief with a strong emphasis on creating a space that the children, family and friends could enjoy for years to come. Elite Design Studio transformed prominent spaces within their luxurious family home which consisted of the kitchen/day living room, new gym and spa, formal living room, dining room, master bedroom and master dressing room. Alongside being contracted for all of the interior design and interior architecture, they also fully project managed the refurbishment, overseeing the entire process from conception to completion. This included the full design service, space planning, project conception, specification of all loose furniture and bespoke items, tender to trades and contractors, procurement, and full project installation coordinating. There were three key rooms which needed the most design attention and also had the most dramatic transformations. The beautiful new open-plan kitchen has really created the ‘wow’ factor their clients wanted to achieve, with entertaining both family and friends being a priority to this young family. Originally, the kitchen was almost half the size, linking through to a small room which housed a family gym, and then opened up into a large indoor swimming pool.All of these areas were out-dated and needed completely re-designing to create the luxurious and opulent space their clients desired. By knocking through the dividing wall between the original kitchen and the small gym, this opened the space up to create this beautiful open plan kitchen area, creating the perfect environment for both entertaining and relaxing which was tailor-made to accommodate the lifestyle of their family within the hub of the home. Whilst working alongside Kitchen Architecture, Elite Design Studio have created a completely bespoke sophisticated Kitchen by incorporating a streamline, seamless cabinetry design, complete with timber veneers, beautifully book matched statuario neolith worktops and a feature bank of eye level ovens. As a result, the combination and balance of all these materials have showcased this show stopping kitchen to perfection. Leading off from this kitchen was originally a tired and dated indoor swimming pool which the clients no longer required within their family lifestyle. With a large double-height space, Elite Design Studio retained the stunning beams at the far end of the room and added in a lowered ceiling detail to the front of the room. This created a defined two zone space within this beautiful gym and spa. At the far end, a large gymnasium was created, with a wall clad in bevelled bronzed mirror, adjacent to a beautiful and completely bespoke, commissioned art panel wall. The flooring was a combination of highly durable textured rubber panels and a large run of black oak which leads your eye all the way through the room towards the striking double doors at the opposite end. The lowered ceiling houses an in-house spa area, complete with a completely bespoke steam room and uniquely designed cabinetry and seating space used to tie both spaces together perfectly. These challenging new layouts within the kitchen and new gym/spa gave the greatest design accomplishments, and resulted in the most exciting transformations within the property. The new master bedroom dressing room was created with both a feminine and masculine design in mind, so that the space flowed effortlessly together through both rooms. A rich chocolate wenge timber was the backbone of this cabinetry, inlaid with stain resistant suede upholstered panels, silver bevelled mirror and clear glass doors to display the clients beautiful array of handbags and shoes. The formal living room and dining room is where the real opulence lies within the project. 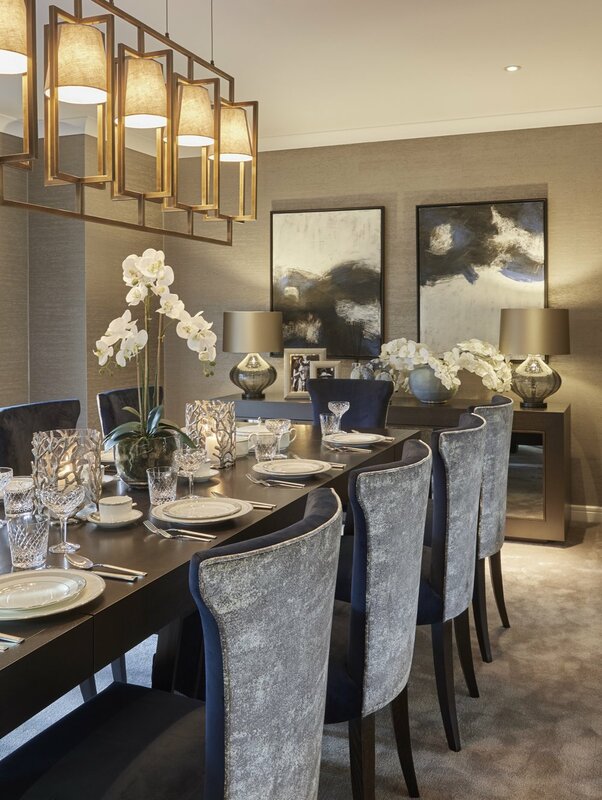 With bronzed applied polished plaster, a rich platinum, gold and blue colour palette and an array of beautifully bespoke soft furnishings, this room has been completely transformed into a beautiful entertaining space. By creating a soft and neutral colour palette with bold tones throughout the rooms of the property, this has enhanced each space to flow seamlessly and effortlessly. By introducing subtle accent colours, beautifully designed, unique, bespoke cabinetry, carefully selected luxury brands and commissioned pieces, Elite Design Studio have impressively refurbished and transformed this property into a sophisticated, stylish and beautiful family home of which both themselves and their clients are immensely proud of.